(Newser) – Black Friday has in recent years received a black mark as retailers took criticism for slowly pushing back the mega-shopping event until it actually started on Thanksgiving Day. Some retailers and shopping venues have given in to the backlash: Various malls (such as the Mall of America) and chain stores including RadioShack and Office Depot will be shuttered on Thanksgiving this year, per CNNMoney. But one of the largest superstores is doubling down, then adding a few hours for good measure, USA Today reports. Toys R Us will be opening its doors at 5pm on Turkey Day and keeping them open for 30 hours straight—until 11pm on Black Friday. "Our customers have voted at the doors year after year, and they continue to want the option to get an early start on their holiday shopping lists," Joe Venezia, executive VP for the company's global operations, said in a statement. My family tries to take every opportunity to spend as much family time together as we can. Being with our family and loved ones means more than material things. There is no guarantee that everyone will be here the following year..... It is sad that the people who manage these stores don't realize that for those who have no choice but to work on these holidays, they are not promoting a family atmosphere for their employees. A lot of people have said they resented having to give up their family time so their stores can take advantage of people. I express my opinion of this by never shopping on Thanksgiving. If the retailers care, fine. If they don't, fine. Different strokes. 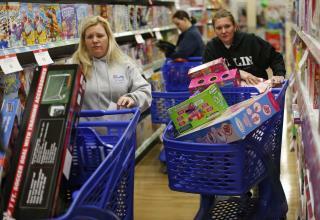 There's something really wrong with leaving your kids on Thanksgiving to buy toys.